Illustration by Borja Mila from the National Museum of Natural Science in Madrid, one of Ellen Ketterson's collaborators, shows the color morphs of Dark-eyed Juncos and Yellow-eyed Juncos across North America. 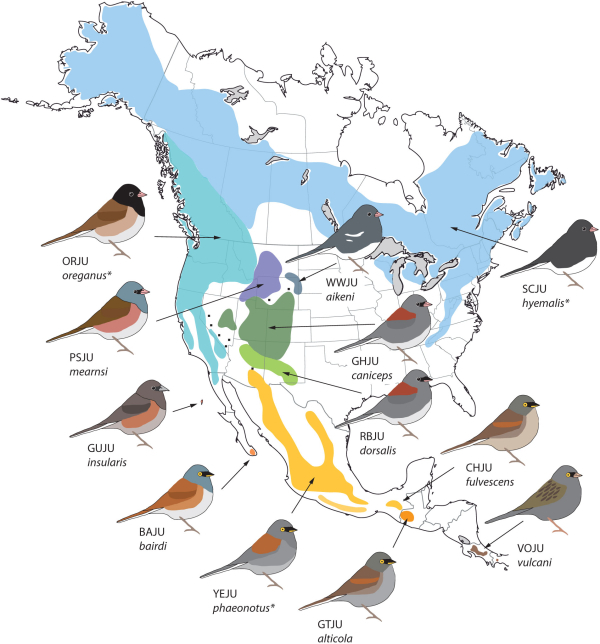 The seven Dark-eyed Junco color forms’ nesting ranges are illustrated across the United States: Counting down three from the top left of the map you can see the ranges of the Oregon, Pink-sided, and Guadalupe forms; counting down three from the top middle area, you can see the ranges of the White-winged, Gray-headed, and Red-backed forms; and at the top right the Slate-colored Dark-eyed Junco is illustrated. 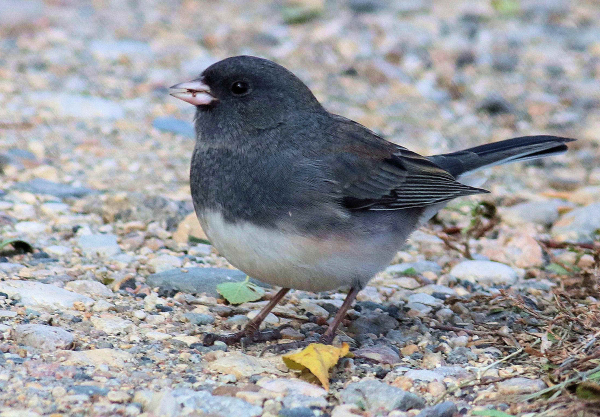 Southern forms of Yellow-eyed Juncos are also presented below the Dark-eyed forms. Dark-eyed Juncos offer an interesting case study into relatively recent evolutionary changes that have resulted in seven distinct color forms, each nesting in different regions, look so distinct from one another that, until the 1970s, they were considered separate species. But they aren’t separate species – at least not yet. 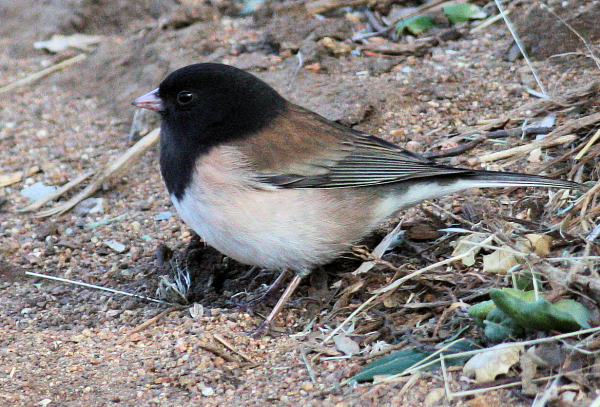 The regional color forms of juncos will occasionally mate and interbreed where their nesting ranges meet, which indicates they are all the same species. “It’s probably speciation in action,” said Ellen Ketterson, an Indiana University Biologist who has studied Dark-eyed Juncos for 45 years. 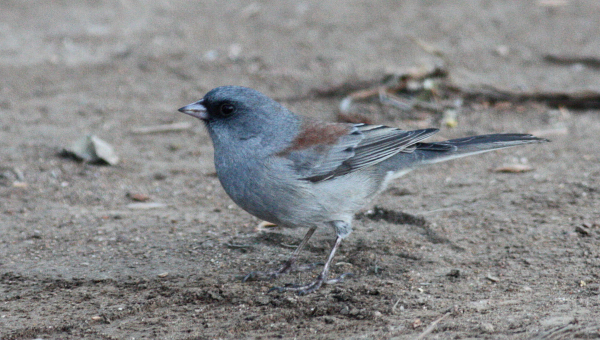 The different regional junco color forms don’t really behave differently, although their songs differ somewhat. They all nest on the ground, eat seeds and bugs, and tend to hop when feeding on the ground. “Juncos seem to be acting like juncos pretty much wherever I go,” Ketterson said. “That’s in keeping with this notion that to whatever degree they are different, it’s recent.” In other words, their feather colors have changed, but that’s about it. And feather color is a more flexible trait than you might think. “All you really need is changes in a gene, or even in the regulation of a gene in a known pathway, to turn a feather from white to black, or black to red,” Dr. Ketterson explained. “It’s pretty superficial, literally, and it could happen pretty fast.” The future of these color forms is also uncertain. Modern climate change could further isolate the groups and potentially lead to more color forms; or it could remove the current barriers, allowing them to reproduce with each other, in which case they would lose their differences. Most Dark-eyed Junco color forms, except the Red-backed form, are migratory to some degree, so even though they separate out during summer to their respective nesting ranges, during winter they may co-mingle. During winter in the Southwest, you may even find two or three junco color forms in the same flock.